Item # 314647 Stash Points: 5,495 (?) This is the number of points you get in The Zumiez Stash for purchasing this item. Stash points are redeemable for exclusive rewards only available to Zumiez Stash members. To redeem your points check out the rewards catalog on thestash.zumiez.com. 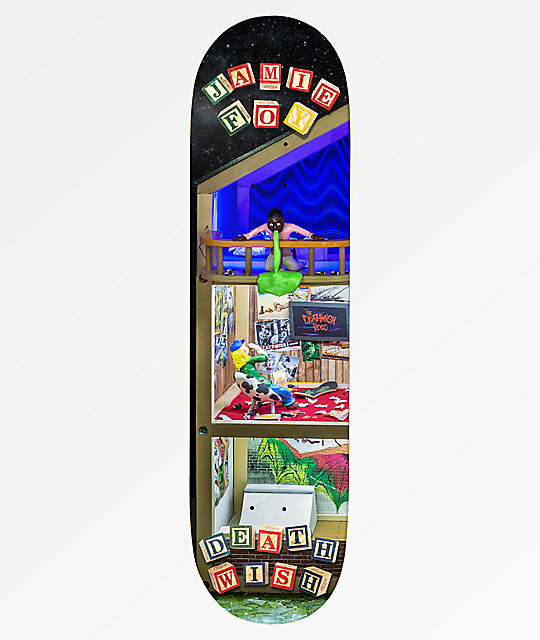 The largest of Jamie Foy's pro model series, the Deathwish Foy House 8.5" Skateboard Deck is a vert and street masher. Constructed in a 8.5" wide shape, this deck provides above average concave for its larger size, allowing for technical riding while still providing a large, stable surface area. Finished with steep, short and extremely wide kick tails, this board has quick, responsive pop while providing stable stalls and controllable tail and nose-slides. Foy House 8.5" Skateboard Deck by Deathwish.